Superb new Clematis just launched at The Chelsea Flower Show 2017 and set to be a real winner! Unique hand sized blooms with the look of a cactus dahlia that just keep on coming all summer long. Purple petals have lime cream tips and give an exotic spikey effect as they unfurl to a spectacular rosette. A real statement plant -grows to about 2m tall - perfect on an obelisk a large patio container or in prim place in the border. Delivered as an established plant in 9cm pot. 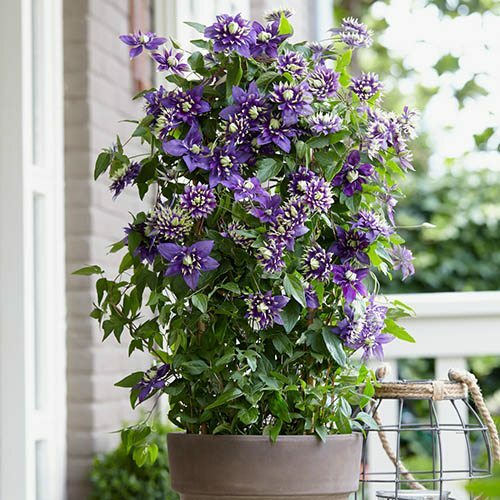 This superb brand new Clematis was launched at the 2017 Chelsea Flower Show and was judged as most admired plant by visitors to the show. The fully double blooms have the appearance of cactus dahlias reaching 4in across or more. Petals are blue purple - each one delicately tipped with a lime cream splash. Opening slowly they give a spiky effect to the flowers which develop into gloriously exotic rosettes. Early to bloom Taiga flowers and flowers all summer long. This is a real statement plant for the garden and uniquely unusual too so sure to be loved by neighbours and friends. Its the ideal plant to grow on an obelisk in a large container or in pride of place in the border scrambling up a trellis or pergola. It's easy to care for and pruning is simple - just cut each stem back to about 30cm in spring just above a pair of buds. this encourages the new growth on which the wonderful flowers are borne. Like most clematis Taiga like a sunny spot and will do best if roots are given a little shade bu lower growing plants.